Squaw Vine is an old folk remedy for "female troubles." Native Americans relied on this herb to help facilitate all aspects of childbirth. Used several weeks before expected delivery, Squaw Vine is thought to tone and stimulate the uterus and encourage a safe strengthen and relax the uterine muscles and thus strengthen uterine contractions. Finally, the herb is said to help expel afterbirth when delivery is over. Squaw Vine is believed to benefit all uterine complaints and many gynecologic ailments and has been used to ease menstrual cramps and bring on suppressed menstruation. The herb is also said to relieve pelvic congestion and alleviate the mucous vaginal discharge of leukorrhea. As a tonic and astringent, it is thought to soothe mucous membranes and reduce catarrh and excess mucus and therefore, be effective in the treatment of diarrhea and colitis. 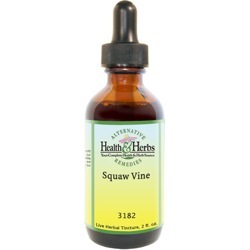 Squaw Vine also exerts a mild tonic and soothing effect on the nervous system and is thought to calm the nerves and ease nervous exhaustion and irritability. Used externally, nursing mothers may find relief in a topical lotion made from the leaves of Squaw Vine when applied to the breasts to ease soreness after breastfeeding. It has also been used as an astringent skin wash. Ingredients: Squaw Vine, Structured Water, 20% Alcohol. Non-Alcohol: Squaw Vine, Structured Water, Vegetable Glycerin. Contraindications: Squaw Vine should not be used until the last weeks of pregnancy and always under the care of a healthcare provider.